Relief (cord) line. In some cases the edge of the product and some detail trim embossed stitching. Such a line is obtained by pull cord. The thickness is taken for this purpose, a simple cord should match the material density and type of stitch. There are various ways of laying wire lines. You can double stitch the folded material, and then between the lines to preteroti cord. In this case it is recommended to accurately ratmerice distance between the lines. With this method the stitch detail will be equally raised from the front and inside of the product. More relief medicines line can be obtained in the following way (Fig. 184). At first lay the line and close to it between the parts, put the cord. Details smatyvay line cord and the lower part in this pull. Then the line brooms lay the second line using the special foot. Again put, cord, etc. Pulling the bottom fabric and the top shear line corded give relief. Order lines were smooth, the distance between them pre-marked. Rounded space you need before carefully prometti, and then gently stitch. If the lines cross, the cord prodelyvat after the line (Fig. 185). Without preliminary plans to sew the cord on the machine using a special foot. Contoured stitching, soutache, braid. 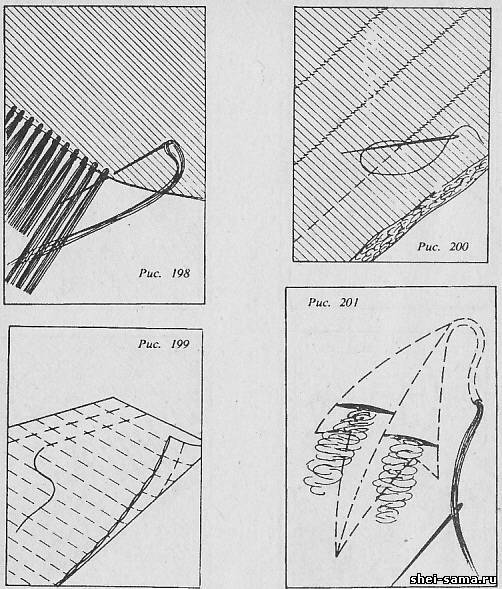 Interesting and modern type of finishing is shaped line (Fig. 186). It is particularly prevalent in the clothes of sports style. For stitching you take one thick and one thin thread. The thick string needs to be the top, but if it does not pass into the needle, then can be wound on the bobbin and scribble product from the inside. Before making a shaped line, you need to verify which line, top or bottom, the machine does better. Stitch is more visible, if it is made large. Usually shaped line feature parallel to one another but can bystrocice and any pattern. For this purpose it is first necessary to draw on paper, tack it to the product and prostratin, delete. Soutache and braid can be used for embroidery of complicated patterns (Fig. 187). Slub line can be done with a cord, as it is very elastic. It primetyvajut and sew with machine or by hand. Trim silk braid. Braid often trim the edges of seams besplatnih coat, jackets, jackets. The silk braid is extremely supple, so it is necessary to pre-primitivity. On products of fat and soft tissues braid sew manually from the front side, and then it folded. Thus it is necessary to ensure that the edge of the fabric was exactly in the middle of the braid. Sew the braid by hand or by machine. Products of thin and thick fabrics pritachivajut braid on the machine, as the seam in this case is not too flashy. The braid can be pristroit on the machine with the front side and tack it from the inside (Fig. 188).You can reverse - pricecat it from the wrong side and stitch from the front (Fig. 189). The braid can be pricecat one seam only when carefully basting both edges (Fig. 190). Trim edge scalloped. The scalloped edge can be done in various way. That they were identical, make a cardboard template of three or four scallops. The material applied to the paper is scheduled scalloped and primetyvajut it at the same distance from the edge. Line are along the lines of the scallops on the paper. Between the two scallops make one cross stitch. This gives the opportunity to nadsech angle in cutting the edge of the fabric close to the seam. Once stitched all the ruffles, thread tacking is removed and the paper removed. Then turn the scallops and irons well.The bottom strips overcast stitch seam and attach invisible stitches. 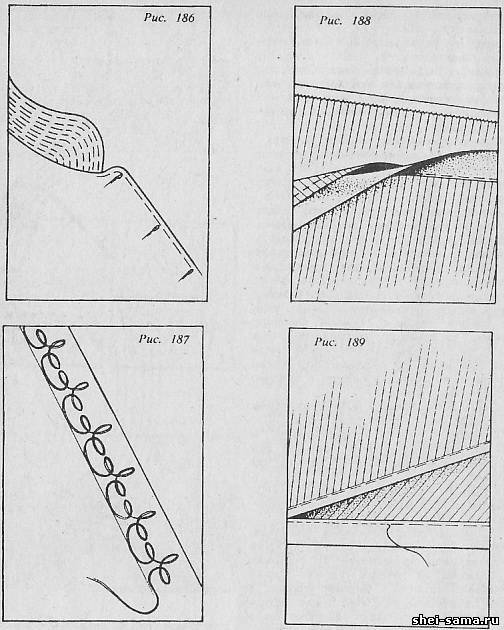 The products thick fabric, type of cloth festoons can be done almetov edge often looped suture (Fig. 191). The methods you can get scallops right shape. 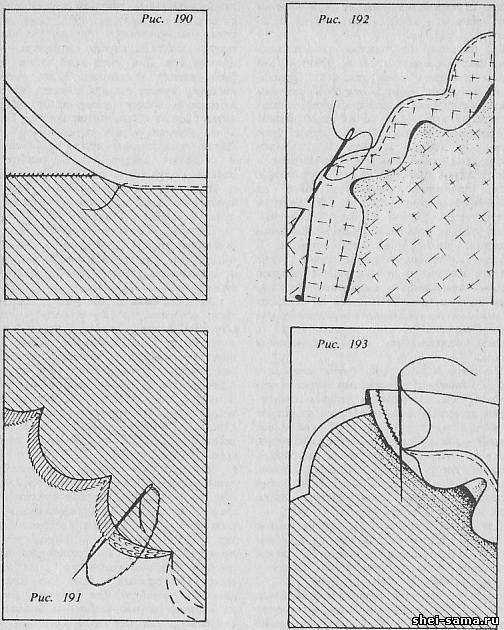 The shape of the scallops are lost while processing them with bias binding or piping, as in this case, the angles can not be repaired. To finish binding the edge of the oblique stripes primetyvajut to the edge of the scallops (Fig. 192) from the front side. After grinding, the strip is folded on the wrong side, the hem of her bends and attach manually to the seam (Fig. 193). After Ironing the corners fasten with a few stitches so they were sharp.In the products of fine fabrics can be finished with scalloped edging. In this case, the front side pritachivajut folded in half, oblique stripes (Fig. 194). They are then folded to the wrong side, straightening the narrow edging. Kant prostrachivajut obtained from the front side of the seam primaqiune stripes. The pompoms and tassels. To make pompom, wrap around wool two cardboard rings, the dimensions of which correspond to the diameter of the pompon. Threads cut on the outer edge of the ring and tie cord or strong thread, which is threaded between the cardboard rings. The ends of the yarn to sew the pompom. Ready, exactly trimmed pompon can hold it over the steam to wool yarns are soft and fluffy (Fig. 195). 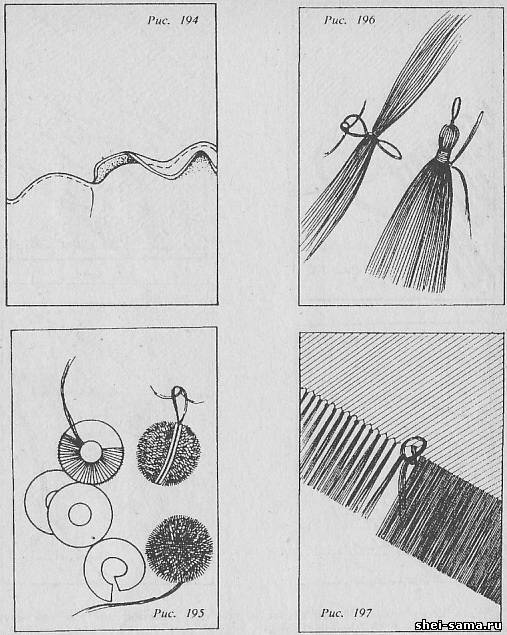 For the brush, take a bunch of long thread and tie it in the middle of a loop, the ends of which can sew the brush, then fold the thread in half and wrap the tassel at the top of the thread (Fig. 196). Using the reserved loop end of the thread under the pull coil in the middle of the brush up. The finished tassel is exactly cut. Fringe. One of the types of finishes is the fringe. It can be made out of the material if it fits the density. Threads of the fabric pull in the same direction until, until the fringe is the desired length. Several threads tie knot, which should be close to the edge (Fig. 197). If the filaments of the fabric pulled hard, fringe can be made of other material, silk or wool. For this purpose the edge of the fabric needs to be hemmed and patched. If, for example, a brush should be done in the six threads into a thick needle prodelyvat three threads.The length of the bundle of threads should be 1 cm more - for tying a knot. Thread prodelyvat over the edge of the material and is wrapped around the left index finger. Received bottom loop is cut and a separate brush knotted close to the edge. You can again tie the two adjacent beam in the middle (Fig. 198). Stitch. Stitch is used for various purposes. Protegat is possible to separate part or all of the product. Depending on the destination stitch doing in a variety of ways. Wystawiamy detail should consist of three main layers: first is the upper material, the second - batting, flannel, or wool and the third backing cloth. The simplest stitch - stitch stripes and squares. Before work all three layers primetyvajut. To each machine attached to the line of stitches, which facilitates maintaining equal distances between the lines. With a ruler the distance you wish to change (Fig. 199). If the drawing is complex, it first primetyvajut. Stitch is performed on a machine or by hand. When you hand stitch you need to ensure that sewn all three layers (Fig. 200). Thread to take stitches in tone or a different color. Before prometti three layers, upper layer is applied to the image and primetyvajut it. If a figure consists of straight lines, it is applied with a ruler. For complex patterns out of cardboard, make a template and impose it on the material so that the distance between the parts of the pattern was the same. When this work is finished, put all three layers on primetyvajut.Along the lines details through the stitch with small stitches or chain stitches. In cases when stitch is trim to the dress, being only the fabric and the lining. Then from the wrong side on the lining, make small slits and the gap between the fabric and lining, filled with cotton wool. Stitch over the edge zametyvayut slits and sew again in the opposite direction. In a narrow space pattern, for example in the stems, threaded several strands (Fig. 201).